The unique wetlands of the Yaqui River drainage in extreme southeastern Arizona support a surprising diversity of wildlife and have sustained a rich cultural history spanning more than ten thousand years. This heritage site includes the San Bernardino and Leslie Canyon National Wildlife Refuges that protect areas critical to the recovery of several federally endangered and threatened species and offer some of the best birdwatching in the United States. More than 280 species of birds are drawn to the aquatic habitats in the San Bernardino Valley, a landscape of flat to rolling desert shrublands dominated by creosote and mesquite. The San Bernardino Ciénega was historically the most extensive wetland in the region, forming an important migratory link between Mexico and North America. The Yaqui River drainage originates in western Chihuahua, Mexico, crosses into Arizona, then proceeds southeast to near Douglas before turning south into Sonora, Mexico. Although much of its headwaters are dry throughout much of the year the Yaqui eventually becomes largest river system in the state of Sonora, and the largest west of the Continental Divide in Mexico. Its waters then navigate through two dams and reservoirs before escaping to the Gulf of California near the port of Guaymas. Surrounded by arid and inhospitable lands, the unique water resources of the Yaqui River drainage have attracted humans for ten thousand years. The Yaqui Apaches occupied the area as early as 552 AD. In 1533, they repelled a Spanish military expedition that was searching for slaves—a victory that cost the Tribe many lives. In 1540, the Coronado expedition passed through. Over the next several centuries the Yaqui Tribe fought valiantly against the Spanish and Mexican troops, and the United States Cavalry, to retain their tribal lands and way of life. Ultimately, they were defeated in a major battle at Cerro del Gallo in 1827, and were forced to submit to Mexican authority. Despite these hostilities, a Jesuit mission and Spanish Presidio were established in the headwaters of the Yaqui River in the 1700s. Cattle ranching, first started in the 1800s, continues today. During the Mexican Revolution in 1915 Pancho Villa and his army fought in nearby Agua Prieta. Expanding settlement of the area brought farming, mining, and livestock grazing that depleted water resources throughout the drainage. This increased use severely altered the aquatic habitats and the wildlife that depended upon them, particularly the eight species of native fish present in the drainage. The San Bernardino and the southern Sulphur Springs Valleys of southern Arizona contribute to the upper Yaqui River watershed. The southern Sulphur Springs Valley drains into Whitewater Draw, which originates in the Chiricahua Mountains and enters Mexico near Douglas. This drainage is perennial for about seven miles, the remainder flowing only during summer monsoons and winter snowmelt. A second tributary, Leslie Creek, exhibits a perennial surface flow across a hard rock area for about two miles. The San Bernardino Valley is dissected by ephemeral streams that flow only during rain events. However, in the central valley just north of the International Boundary, discharge from artesian wells and springs flow into Black Draw, a perennial stream on the San Bernardino National Wildlife Refuge and the largest drainage in the valley. Ranging in elevation from 3,720 to 3,920 feet, the wetlands and riparian habitats support a wide diversity of birds including ducks, woodpeckers, cranes, hummingbirds, and raptors. Coyote, bobcat, and the occasional mountain lion prowl through the refuges, along with mule deer, whitetail deer, badger, and javelina. Eight species of fish are native to the Yaqui River drainage, including federally endangered Yaqui chub and Yaqui topminnow. Yaqui catfish and Yaqui beautiful shiner, both threatened species, were once extirpated in the United States but were successfully reintroduced from Mexican populations. Other fish native to the drainage are the Mexican stoneroller, longfin dace, roundtail chub, and Yaqui sucker. Today, the Yaqui sucker is extirpated from the United States, but all of these species still survive in Mexico. The Chiricahua leopard frog, once widely distributed throughout the wetlands of southeast Arizona, is now listed as a threatened species. Predation by non-native bullfrogs, habitat degradation, and exposure to a lethal fungal skin infection challenge their survival; their populations continue to decline. The lands represented today in both National Wildlife Refuges originally were part of the San Bernardino Land Grant that was purchased by Texas John Slaughter in 1884. A 2,309-acre cattle ranch was acquired by The Nature Conservancy in 1979. In 1982, the land was transferred to the U.S Fish and Wildlife Service (FWS) and established as the San Bernardino National Wildlife Refuge to protect the water resources and provide habitat for endangered native fish. Another 2,270-acre ranch was acquired by The Nature Conservancy in 1988 and also transferred to FWS. This area, the Leslie Creek National Wildlife Refuge, was established to protect the rare gallery forest of velvet ash, cottonwood, and black willow present in Leslie Canyon, as well as threatened and endangered fish. Today extensive watershed renovations on lower Whitewater Draw and upper Black Draw within the San Bernardino National Wildlife Refuge are resulting in a rising water table and the recovery of riparian vegetation. The use of gabions and trincheras (loose rock structures) to slow down and retain water is beginning to restore ciénega sites (see water harvesting at the website www.cuencalosojos.org). Both refuges are internationally significant, playing a critical role in supporting populations of native fish by restoring and maintaining aquatic and riparian habitat in the United States and Mexico. Visits to the refuge require a Special Use Permit that is available at the Refuge Office in Douglas, Arizona. Chuck Minckley and Jeri Ledbetter. Coleman, S. M. 2002. El Coronado Ranch 2000 & 2001 fish monitoring West Turkey Creek, Chiricahua Mtns. Cochise Co. AZ. Ecological Services, U.S. Fish and Wildlife Service, Tucson, AZ. 28 pp. Discover Arizona Website. San Bernardino National Wildlife Refuge. http://www.discoverseaz.com/Attractions/SanBernRef.html. 11/24/07. Minckley, W. L. and P. C. Marsh. 2008. Chronicle of a vanishing biota: Inland fishes of the American southwest. Univ. Ariz. Press, Tucson. (In Press). U.S. Fish and Wildlife Service. 1994. Yaqui Fishes Recovery Plan. 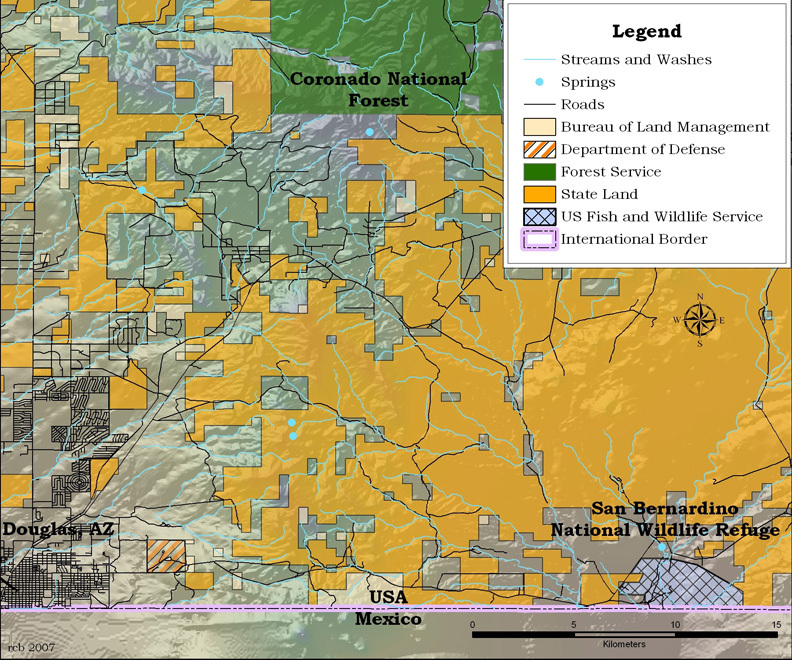 USDI Fish and Wildlife Service, Albuquerque, NM 48 pp. -2003a. San Bernardino/Leslie Canyon National Wildlife Refuge. -2003b. San Bernardino/Leslie Canyon National Wildlife Refuge, Watchable Wildlife List.